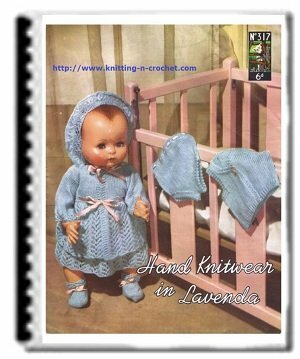 Free knitting doll patterns for a cute cardigan, skirt and scarf. This is a cute little three piece outfit consisting of a cardigan, skirt and matching scarf. 4 ply. 25(30-35) g. Pair needles each size 3mm (11) and 2 1/4mm (13). Shirring elastic for Skirt. 4 press studs. Using size 3mm needles cast on 27(30-33) sts. 1st row: Knit. 2nd row: K4, p to last st, k1. 3rd row: K1, p to last 4 sts, k4. 5th row: K1, p to last 4 sts, turn. 6th row: Knit to end. 7thand 8th rows: As 3rd and 4th rows. 9th and 10th rows: As 1st and 2nd rows. 11th row: K 15(17-19), turn. 12th row: P to last st, k1. Rep these 12 rows 9 times more. Cast off. Do not press. Join back seam. Thread 2 rows of shirring elastic through garter st waistband to fit waist. Using size 2 1/4mm needles cast on 21(23-25) sts. 3mm needles and work 16(20-22) rows in st st, starting knit. Cast off 3 sts at beg of next 2 rows. 15(17-19) sts remain. Work 8 rows in st st.
Next row: Cast off 4(5-6) sts, k to end. Rep the last row once more. 7 sts remain. Cast off. Using size 2 1/4mm needles cast on 11(13-13) sts and work 4 rows in k1, pl rib as given for Back, decreasing 1 st at end of last row on 2nd size only. 11(12-13) sts. Change to size 3mm needles. 2nd row: K2, p to end. Rep the last 2 rows 7(9-10) times more. Next row: Cast off 3 sts, k to last 4 sts, k2tog, k2. Next row: K2, p to end. * Keeping garter st border correct dec 1 st at neck edge inside border as before on next and every following 4th row until 4(5-6) sts remain. Work 1 row. Cast off. Back, decreasing 1 st at beg of last row on 2nd size only. 11(12-13) sts. Change to size 3mm needles. 2nd row: P to last 2 sts, k2. Rep the last 2 rows 7(9-10) times more, then 1st row again. Next row: Cast off 3 sts, p to last 4 sts, p2tog tbl, k2. Join side and shoulder seams. Join sleeve seams leaving 4 rows open at top. Insert sleeves. Sew 3 press studs in place on front bands. Using size 3mm needles cast on 36 sts and work 6 rows in garter st (every row knit). Next row: K2, sl 1, k1, psso, k to last 4 sts, k2tog, k2. Continuing in garter st, dec 1 st at each end (as before) on every alt row until 6 sts remain. Next row: K2tog, k2, k2tog. Next row: [K2tog] twice. 2 sts remain. Cast off. Sew half a press stud to each end of scarf.